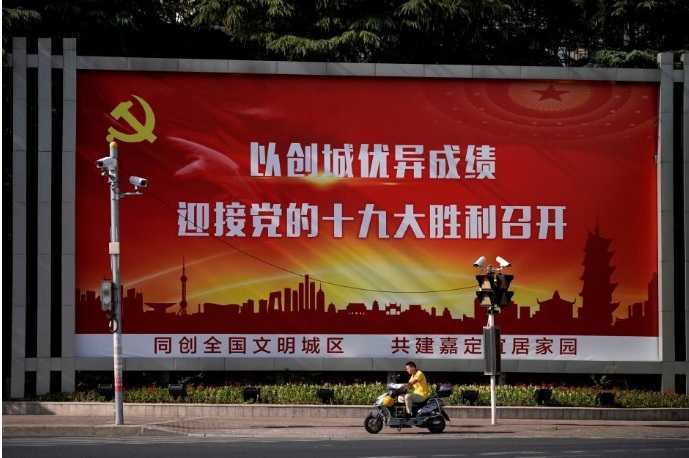 A man rides an electric scooter past a poster, promoting the 19th National Congress of the Communist Party of China (CPC) in Shanghai, China September 14, 2017. BEIJING - Stability is an absolute principle that needs to be dealt with using “strong hands”, Chinese President Xi Jinping has told security officials ahead of next month’s key Congress of the ruling Communist Party. The stability-obsessed party brooks no challenge to its rule and always steps up security ahead of important meetings. Those working in the public security sector should improve their political awareness and maintain the authority and unified leadership of the party, Xi said, in comments reported by the official Xinhua news agency late on Tuesday. “Xi noted that development and stability were the absolute principles, so both should be dealt with by strong hands,” Xinhua said. It is important to prevent and control major risks through the party’s leadership, Xi added. More effort needs to be exerted to improve “social governance by socialism with Chinese characteristics” to ensure the country enjoys long-term peace and stability, he was cited as saying. Xi has overseen a broad crackdown on civil society since he assumed office almost five years ago, locking up rights lawyers and dissidents who the government has accused of breaking the law and in some cases of seeking to subvert party rule. The party also remains wary of what it terms “mass incidents”, a euphemism for protests, of which there are thousands every year in China, over everything from illegal land seizures and pollution to corruption. The party opens its once-every-five years Congress on Oct. 18, where Xi will seek to consolidate his already tight grip on power. Stability is an absolute principle that needs to be dealt with using “strong hands”, Chinese President Xi Jinping has told security officials ahead of next month’s key Congress of the ruling Communist Party.